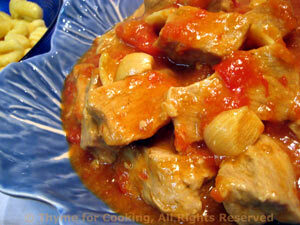 Braised Veal with Garlic, from Thyme for Cooking's seasonal menus. Leftover Veal from Saturday with some simple boiled potatoes and Sautéed Sprouts. Gently reheat in a saucepan or microwave until hot. Sometime the simple things are best ....butter is optional! Scrub potatoes and cut into quarters. Put into a sauce pan and cover with water to which you add 1/4 tsp salt. Cover and bring to a boil. When boiling move cover so it is ajar else the potatoes will boil over. They will, I promise. Remove from heat when done (stick a knife in and test - should go in easily). Drain, add butter, salt & pepper if using, and serve. 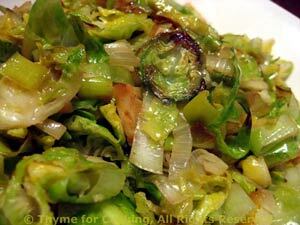 I'm learning that these little green 'cabbages' are very versatile, and the key to good sprouts is not overcooking. Shredding, followed by a quick sauté is perfect. Thinly slice the sprouts, cutting the larger ones in half first. Trim the leek, cut in half the long way. Thinly slice half of the leek, reserving the rest for another use. Heat oil in a medium nonstick skillet over medium-high heat. Add leeks and sprouts. 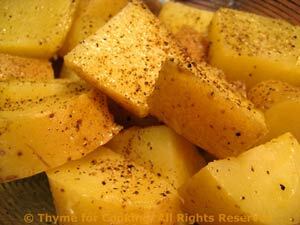 Sauté until they start to develop brown spots but are still crisp tender, about 7 minutes, stirring often. Stir in vinegar, remove, sprinkle with sea salt and serve.